I want to start by thanking Warner Brothers for inviting us along to their Multimedia Screening of The LEGO Movie 2 last night. We were certainly not expecting to see an appearance from Chris Pratt and Elizabeth Banks who gave an introduction before the film. The LEGO Movie 2 begins where we left the first film. Emmet (Chris Pratt) Lucy aka Wyldstyle (Elizabeth Banks) and his friends have ended Lord Business' reign of terror but before they can celebrate, aliens from Planet Duplo invade. Devastation is caused over Bricksburg before it then cuts five years into the future. Emmet now lives in a dystopian city where "everything's not awesome". No one but Emmet seems content with this new way of living, as he tries to build a new life (excuse the pun) for himself and Lucy. When an alien being arrives to invite them to a cordial event, the group refuse to attend. They are then kidnapped and flown away leaving Emmet alone in Bricksburg. Despite having been The Special the rest of the town doubt his ability to do... well, anything useful. Emmet must now take it upon himself to cross space to get his friends back. I really enjoyed this film. More so than the first one which is often hard to do. It really had something for everyone. 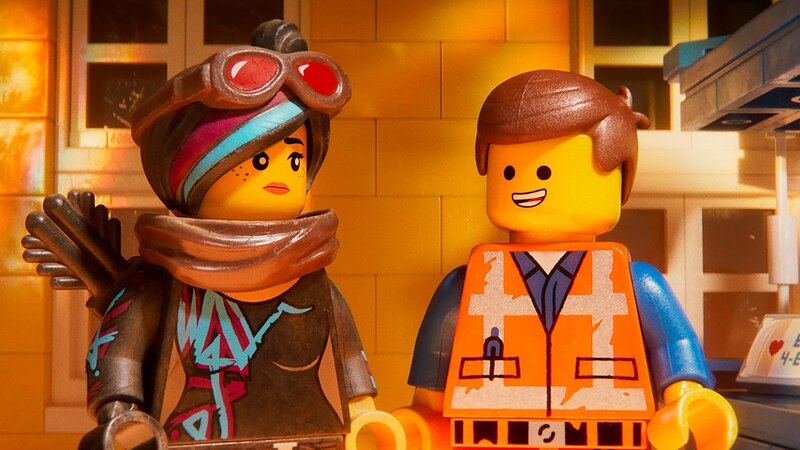 The LEGO Movie 2 is jam-packed with pop culture references and cameo appearances. I enjoyed a lot of the fourth wall breaks from Chris Pratt’s second character, Rex Dangervest. References to Jurassic World and his days on Parks & Rec were subtly and not so subtly placed amongst his dialogue. He was one of the stand out characters for me in this film. Tiffany Haddish also plays a key role as queen Whatevra Wa'Nabi. I wasn’t expecting this film to have so many musical numbers but she really killed it. The new cast brought something fresh and exciting while the characters we already know and love maintain the charm of the first film. This film really outdid the original on the visuals. Exploring space and other planets in the Systar System was really entertaining and really showcased the difference four years makes on animation. The audience laughed from start to finish which created such a great atmosphere and it was fun seeing a full cinema of people from all different age groups enjoy a toy we've all grown up with. It catered to the more mature members with subtle jokes and references like Hot Tub Time Machine and The Matrix while also being family friendly. A personal favourite part of mine were the subtitled velociraptors. Outside of the LEGO Universe we also get to see the relationship between Finn and his younger sister who have built this LEGO world together. I thought the underlying theme of family and growing up was a nice touch to an action packed adventure that otherwise doesn’t have much relation to real life. There is definitely room for a third film and I'd welcome it based on The LEGO Movie 2. The LEGO Movie 2 is out in UK cinemas February 8th 2019.